Not many people know this but just over 700 years ago, in 1305, Robert the Bruce was a temporary resident of Highgate! He was staying in the hunting lodge which belonged at that time to the Earl of Gloucester, situated on what is now the 12th green of Highgate Golf Club. The archaeological evidence is still visible, and the area was known for many centuries as Lodge Hill. Robert the Bruce was there to try and recover the remains of the Scottish hero, William Wallace, which were reputedly buried in the chapel of the lodge. The King, Edward 1, also known as the Hammer of the Scots, got wind of the Bruce’s presence and sent a troop to capture him. A court officer who sympathised with Bruce, heard the King give the order and sent a secret message – a spur and a coin with the king’s head on one side. The implication was clear – the King knows you are here, run for your life! Bruce escaped and lived to become King of Scotland. The story is that he rewarded the messenger with a coat of arms referring to the coded message. Six hundred years later, John Grove Johnson – a descendant of that messenger – built a large house, Southwood Court, on the corner of Southwood Lawn Road and Southwood Lane, in Highgate. He put an escutcheon bearing the coat of arms on the chimney breast of his drawing room. When the house was demolished in 1965, the escutcheon was removed and reset into the wall of what is now the estate of Southwood Park, on Southwood Lane. 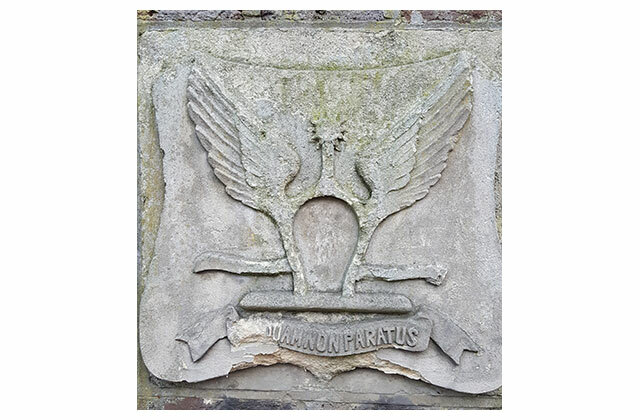 It shows a winged spur and the motto, now partly eroded, is ‘numquam non paratus’ – never unprepared! Is it a coincidence that two links to a famous King of Scotland, soon to be celebrated in a major cinema film, starring Chris Pine, are located within a mile of each other, in Highgate, a leafy suburb of London? The future king of Scotland was not the only royal resident. Queen Elizabeth I and James II also visited, We should style ourselves Highgate Regis! If Bognor and Lyme can do it, so can we!